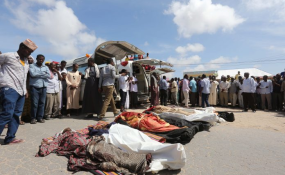 Civilians killed by U.S. and Somali forces (file photo). Heavily armed Al Shabaab fighters mounted in battle wagons wrested control of a strategic town in Hiiraan region, central Somalia from Ethiopia's Liyu Police forces on Wednesday. In a statement posted on its affiliated websites, the militants said they have retaken El Adde town, about 70Km away from Beledweyne city after an attack on notorious soldiers. Al Shabaab added that it seized a cache of weapons and inflicted irretrievable losses on Liyu Police forces, but, did not verify the casualty figures. Hiiraan regional authorities are yet to comment on the takeover of El Adde by Al Shabaab.